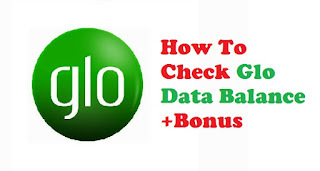 How To Check Glo Data Balance: Two(2) Best Methods +Bonus - BaseOnTechs - Learn To Do It Yourself. It's quite easy to forget how to check glo balance. It's a normal thing. Especially when you're not the techy type. Now, it's not a problem to buy a data plan, but how to check and monitor it. And yes, it is very important always know how to check glo data plan via SMS, online or via USSD to enable you to monitor your purchased data if glo is consuming more data, even faster. Still, on that, iOS users are also in need of help on how to check glo data balance on Ipad. Don't worry much, after reading this post you will be able to check glo data balance on Android and other devices without stress. Checking glo data balance is quite simple, kindly below steps to make it possible. I'll be including extra tips on how to check glo bonus data balance as well, so just keep calm and select your choice. There are many ways to check glo data balance and one is via SMS. Yeah with a short message sent to glo you will immediately receive your data balance details in seconds. Immediately you'll receive a message from Glo having the data balance statement with purchase date and expiry date. Using your dialer, you can possibly see your Glo data balance in seconds. This method is faster and easier to follow. The dialer is always on phone Home Screen, One o'Clock you're done. So what is the code to check Glo data balance(USSD)? You may choose check data based on the type of plan you have purchased. It's Simple and OK either. Now select your active data plan to see balance. Network providers can be funny at times, they may just decide to give you free data bonus either as a new user or an active user. Now, what if I was given free data bonus on Glo how do I check it? Below is how to. Immediately you will see pop-up giving you details of your data bonus. Glo might send you a message. For Glo 200% Bonus, Kindly dial below USSD code. Dial *122*10# and that's it. Yeah and above is how to check Glo data balance on a device. I believe you can now do it yourself. And also make sure you bookmark or save this page so you can get in touch whenever you forget. And For more information about Glo data balance and more kindly visit their official website at www.gloworld.com, you are good. You can as well watch below video for more info. Submit Your Best Email Address Here.